The protesters gathered downtown Saturday, Jan. 19 in opposition to gendered oppression. 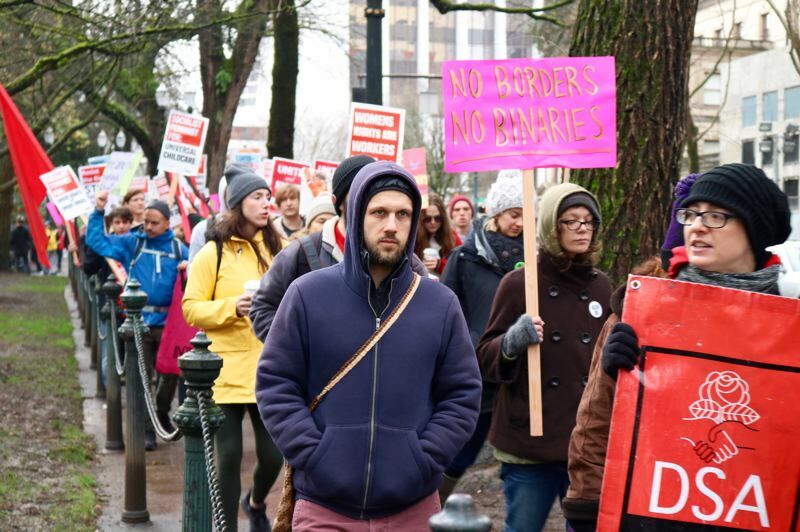 Portland protesters synchronized with those marching for women across the nation on Saturday, echoing their chants against gendered oppression throughout downtown streets and squares. The scaled-down demonstration drew more than 100 supporters — a far cry from the tens of thousands who packed the city's boulevards in January, 2017 for the original Women's March, which was spurred by the inauguration of President Donald Trump. Since then, the national organization has been riven by allegations of anti-semitism and marginalization of women of color. The schism spread to Portland, with the Saturday, Jan. 19 #MeToo Speakout competing for support with a "Reclaim MLK March" on Jan. 20, as well as a semi-official Women's March said to be occurring in the Rose City in March. 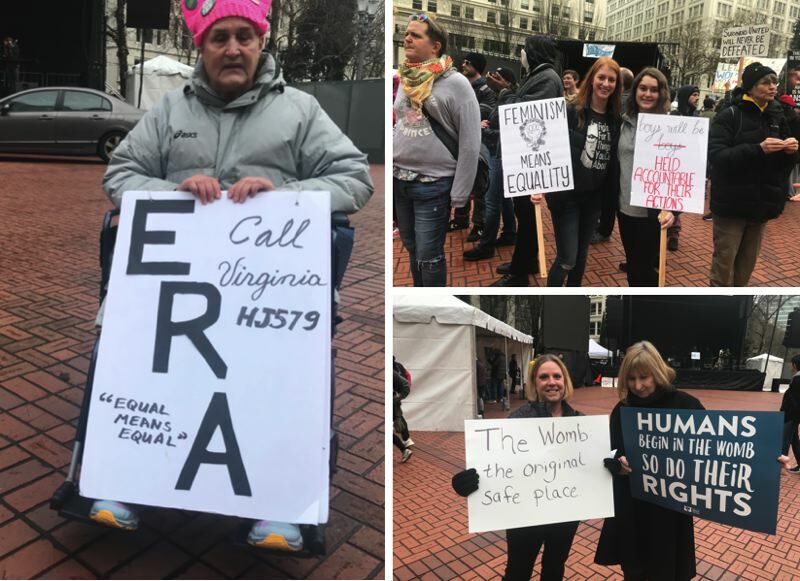 But the factionalization was no deterrent for Mary Whitmore, who traveled from Forest Grove to advocate for the proposed Equal Rights Amendment whose ratification remains an unsettled question. "I realize that the ERA is not on the millennials' agenda. They were born too late," Whitmore said. "So I'm reminding people that we still need it." Whitmore said she once lost access to unemployment benefits in 1971 because she was five months pregnant and the government determined she was no longer eligible to work. She remembers receiving the checks years later because "women cared" and filed a class-action suit. The Speakout supporters first gathered at Terry Schrunk Plaza at 10 a.m. before taking off for a winding march to the call-and-response of "Me Too is here to stay! All you rapists go away!" The protesters abandoned the sidewalk after reaching Southwest Pine Street, prompting a blast from the Portland Police Bureau's amplified sound truck demanding they not block traffic. 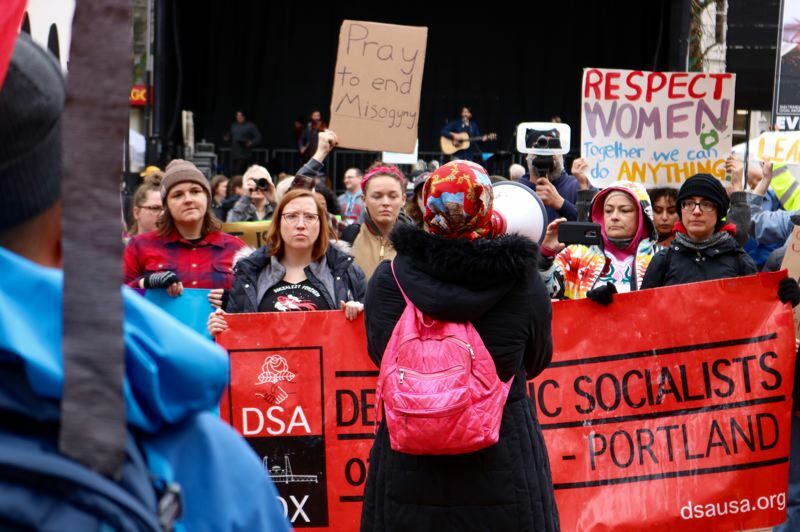 The order was largely complied with, and the crowd soon reached Pioneer Courthouse Square, where they turned their backs on a pro-life rally and continued to chant. "We're really frustrated with what's happening in our society today," said Arianna, a junior at Columbia River High School in Vancouver. She says the current administration is "racist, sexist and homophobic." "We're not of age to vote. This is the way we can show our support," Arianna said. It's getting our voice out there," added her friend Carly. "While tension between the liberal demonstrators and attendees of the Oregon Right to Life rally was to be expected, members of the conservative Patriot Prayer group twisted the day's narrative with an unexpected visit to the International Workers of the World house at 2249 E. Burnside St.
Joey Gibson and about 20 others reportedly squared off with local anti-fascists outside the house, according to a video and other accounts posted on social media. Portland police did not immediately release news of any arrests or injuries resulting from the clash. Back at Pioneer Square, the anti-abortion activists carried signs and listened to a church worship band and speakers. Hundreds of pro-life supporters filled the square for the rally after most of the counter-protesters had left. Gwen, a Clackamas resident who declined to give her full name, believes that life begins at conception. "Children should be looked upon as a gift, not a burden," she said. "When a mother decides to terminate her pregnancy, she's throwing that gift back at God's face." CORRECTION: A previous version of this article misstated how many people attended the rally organized by Oregon Right to Life. A reporter mistakenly observed the size of the crowd before the event's official start time.